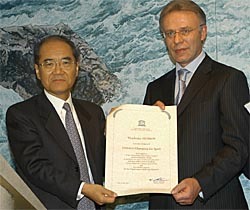 22-05-2004 5:30 am Russian ice hockey champion Vyacheslav Fetisov, who heads the Russian Federation’s Federal Agency for Sport, Physical Education and Tourism, will be named UNESCO Champion for Sport by UNESCO Director-General Koïchiro Matsuura in a ceremony at UNESCO Headquarters on Wednesday, May 26, 6.30 p.m. The nomination of Mr Fetisov comes “in recognition of his outstanding achievements in sport and his exemplary efforts to promote the values of physical education and sports with a view to building a better future for younger generations and his valuable support to the Organization’s ideals and objectives”. Mr Fetisov - twice Olympic ice hockey champion, seven times world champion, and ten times European champion – has been an active promoter of sport and physical education among young people living in difficult conditions, advocating the inclusion of sport as an integral part of education and training. Born in 1958, Mr Fetisov played in the Soviet Union’s National Team from 1975 to 1989, when he became a National Hockey League (USA) player for the New Jersey Devils and Detroit Red Wings, until 1998. He received the highest distinction in professional hockey, the Stanley Cup, three times between 1998 and 2002, when he coached the New Jersey Devils. In 2002, Mr Fetisov became the director and coach of Russia’s Olympic ice hockey team. Other leading sports figures have rallied to UNESCO’s cause, including Formula One driver Michael Schumacher, French judo champion David Douillet, Ukrainian pole-vaulter Serhiy Bubka who are UNESCO Champions for Sport and football player Edson Arantes de Nascimento, better known as “King Pele” who became UNESCO Goodwill Ambassador in 1994. Photo © UNESCO/Michel Ravassard: Russian Hockey Champion - Viatcheslav Fetissov.